Not only are kitchen islands functional and beautiful, they're fun! That inviting counter at the center of your kitchen just calls out for baking cookies and rolling out pizza dough. The Amish Pine Wood Farmhouse Kitchen Island adds rustic appeal that exudes cozy as it works in your kitchen. This kitchen island features storage cabinets, a counter space and lots of solid wood style. When you've determined you need to save space and have your kitchen performing numerous tasks, a kitchen island is a great candidate for running things efficiently. The island adds counter space that makes it easier for the kids to snack at or do homework at or for the family to gather at for casual dinners during a busy workweek. 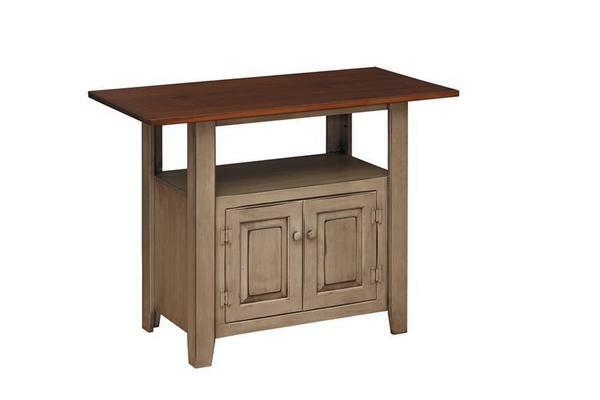 Made of solid pine wood, this farmhouse style kitchen island is offered at a great price. Pine wood is softer, but still does a top notch job and it shows off distressing options and a painted finish better than other hardwoods. If a new kitchen island is the way to go for your family, we offer a wide variety of the finest Amish made kitchen islands. They can be customized in many ways to offer the exact look you're going for in the kitchen. We offer large to small kitchen islands, some with butcher block tops and others with maximum storage. Please email or call us today with any questions. Thank you for shopping DutchCrafters for your new kitchen island. Overhang on Sides: 7 1/2"